The National Park Amboro between Cochabamba and Santa Cruz is situated on the lower slopes of the Andes to the Amazonas basin. It is famous for its density of game and insects, for beautiful waterfalls and natural swimming pools, and thick green jungle fauna. There are few camps inside this park, which can be accessed with a guide from the North via Buena Vista or the South via Samiapata. 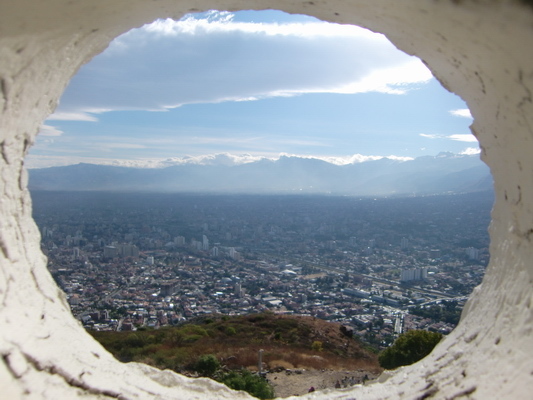 Cochabamba is the third biggest city in Bolivia with more than 800,000 people. It is located in a nice valley of the Andes at 2570 meter sea level; thus it has a very pleasant climate. 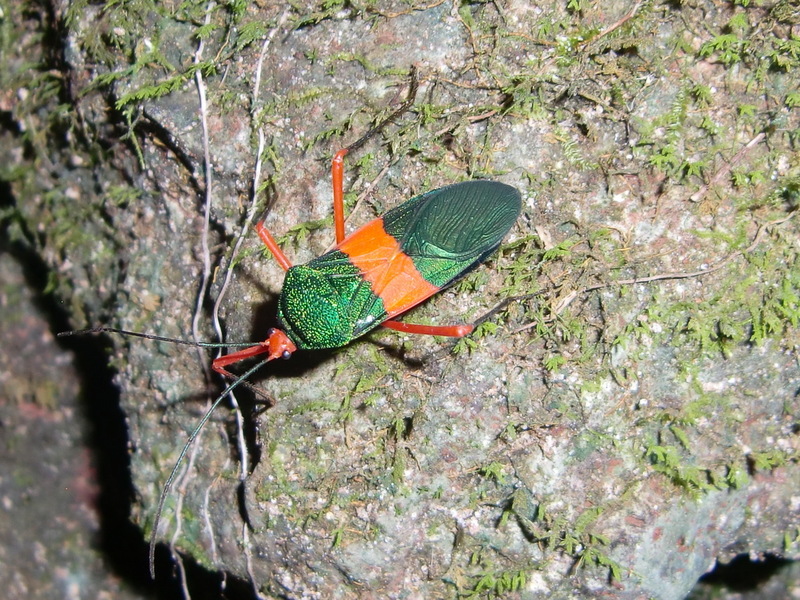 It is half the way between La Paz and Santa Cruz, the other two large cities in Bolivia. Its main attraction is the huge Jesus monument "Cristo de la Concordia" on a hill, more than 40 meters high. When we left the Hotel Oberland in La Paz we heard a weird noise from the starter of our car. Besides that is was smoking like hell, again. So we decided to go to Eduardo, who manages the Bosch Diesel Service La Paz in El Alto the highest quarter of La Paz, around 4100 meters sea level. They revised the starter, the fuel pump and exchanged all Diesel tubes and the fuel filter. It was a lot of work; consequently we stayed 5 days in the service station. We had all comfort like electricity and hot shower. And we had enough gas for our heater, because it became very cold, especially in the evenings. The last morning we had some fresh snow. Thanks a lot Eduardo and the Bosch Diesel service team (GPS coordinates: S16° 31.944' W68° 10.483'). We used the time to visit the museums in La Paz; we like very much the coca museum and the masks in the folklore museum. On the way from La Paz to Cochabamba we had to cross the 4496 pass La Cumbre with some new snow. 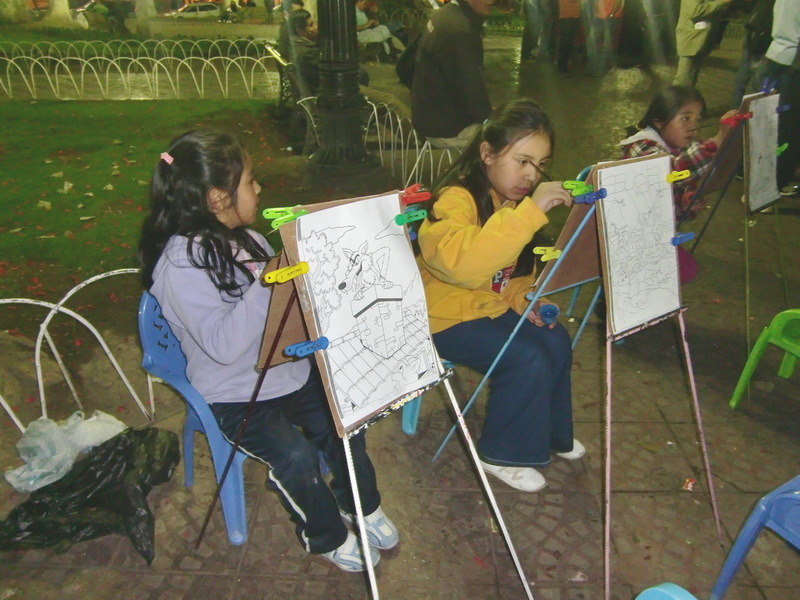 Cochabamba is a pleasant and busy city with a beautiful central place, the Plaza Prinicipal. In the evening kids were painting there. And we got the best Pizza there so far in South America. 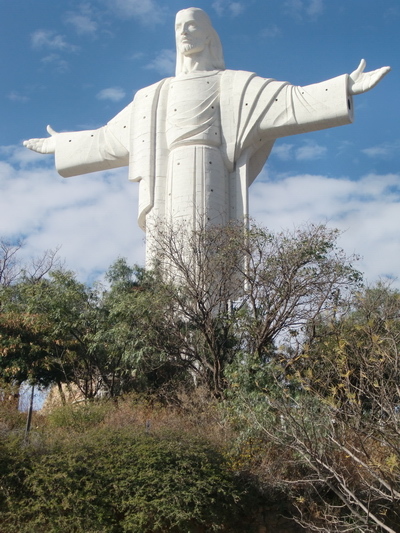 The Jesus monument is enormous and you have an excellent view to Cochabamba. The people there claim that this is the highest Christ monument of the world. It is possible to go up inside the monument to the arms of Jesus. There is a marvelous park around the Christ effigy. It is accessible via a modern funicular, which is unbelievable cheap. And it was weekend, so a lot of native people were visiting Jesus. 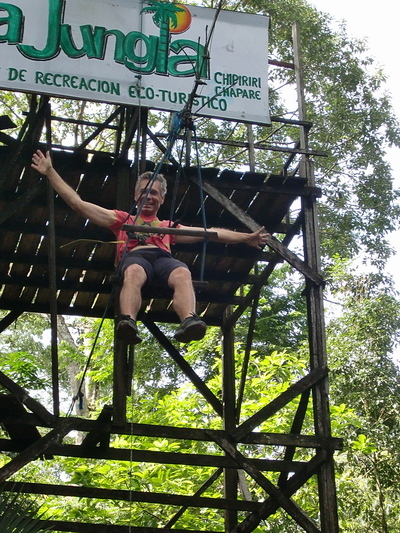 Between Cochabamba and the National Park Amboro is the jungle village Villa Tunari, just 350 meters high. The first night we stayed in the stunning forest camp La Jungla 7 km north of Villa Tunari in the village Chipiriri, which is managed by younger people. This is a kind of a fun park and there are very high swings there. Of course we had to do the tour in the next morning, which costs just 4 bucks per person. It started moderate walking on bridges in the middle of the trees and it ended with a 3 meter high swing followed by a 50 meters long tyrolese. The next swing was 6 meter high and you got an impressive speed there. 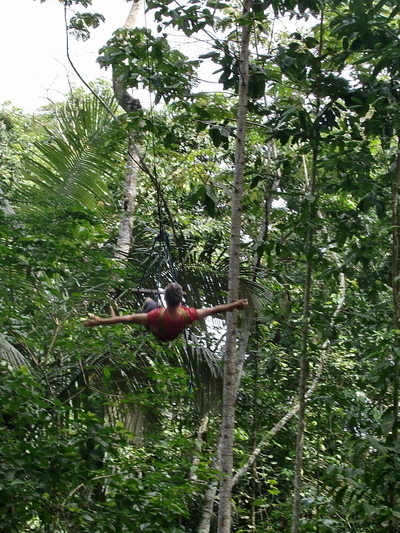 A 12 meter high swing followed and finally a 18 meters high. Incredible! On this tour we were accompanied by one young man. We felt very safe, e.g. on the 18 meter swing we got a lap belt to secure us. 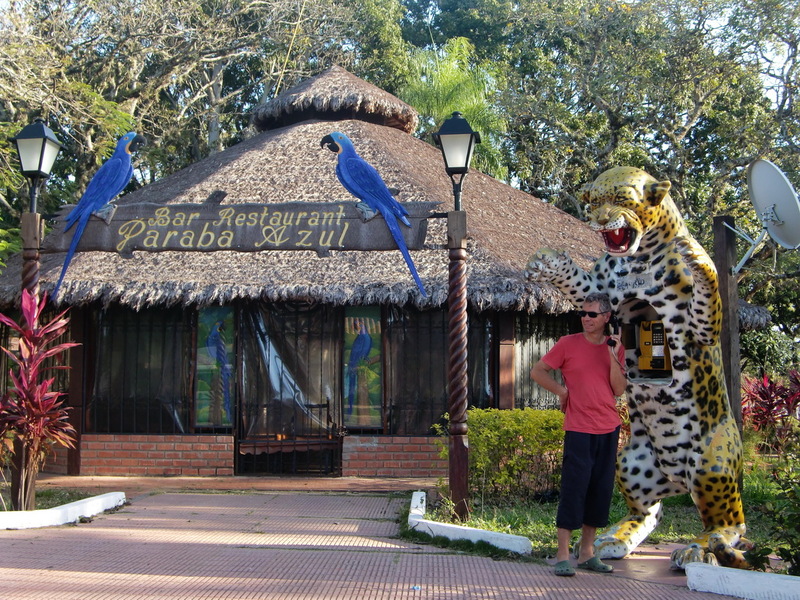 We visited also the Parque Machia, which includes a recreation area for wild animals which were abused by humans. The target is that these animals can live in the wilderness again. It is not allowed to take a look to the "patients", but there is a nice viewpoint after 40 minutes walking where some monkeys anticipating tourists. 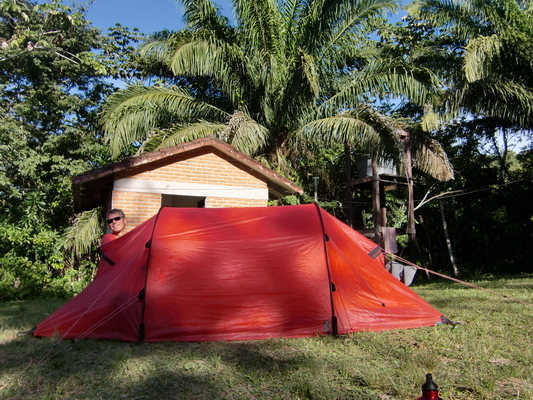 We stayed the second night in Villa Tunari at a football ground closed to the river. Again our car did not start on the next morning. We tried everything - no chance. 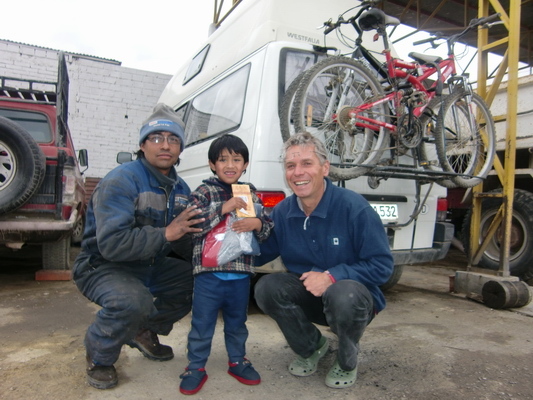 Fortunately a family helped us and one of them was a car technician. He detected some problem with the electricity of the fuel pump and he bridged its power supply with a cable. The engine started properly - Thanks a lot. We drove to a workshop and realized that the fuse for the motor electronic was broken. After exchanging it, we did not need the bridging cable any more. Our next destination was Buena Vista, a very pleasant and clean village - a lot of Germans live there. 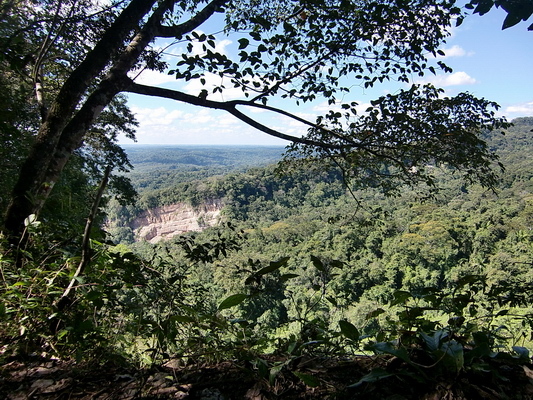 Buena Vista is also the gate to the National Park Amboro, a highlight in Bolivia. It can be visited only with a guide. A "native" German sent us to Rene Rivas, who is running the agency BIOFUN TOURS (www.biofuntours.com). Rene speaks very well English and he and his wife were sympathetic immediately. Rene did a great job, e.g. we got the first PowerPoint presentation in South America about the different trips and possibilities of the National Park. 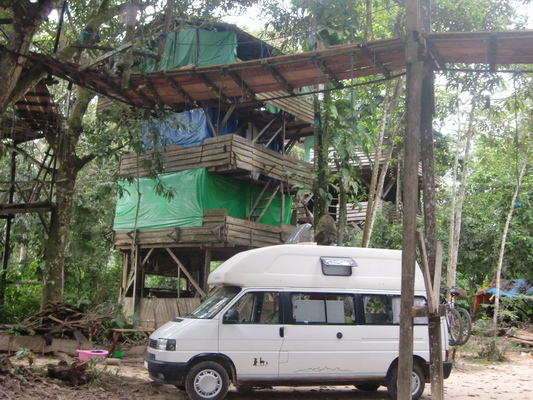 We decided to do a 4 day tour at the Maracaru camp. 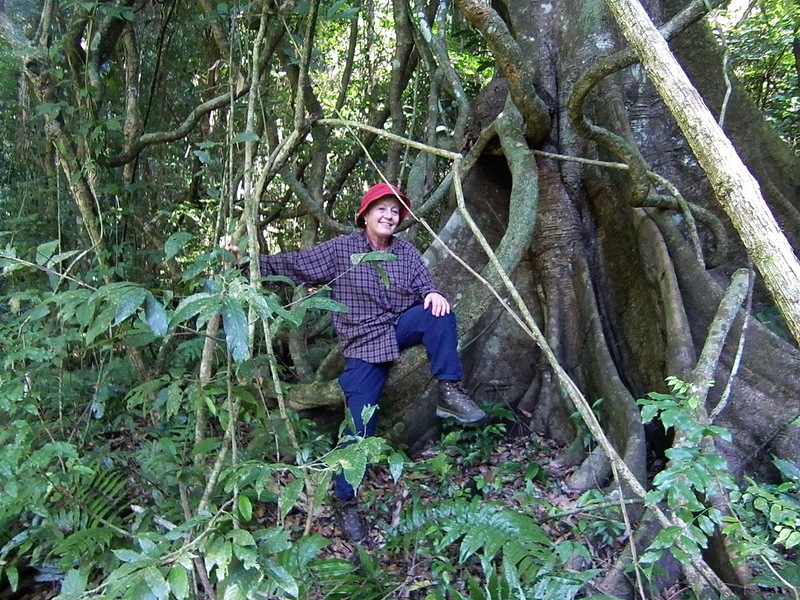 We started our jungle trip with our guide Limbert and his father in the next morning. Limbert drove us in an ancient Toyota Landcruiser more than 2.5 hours to the Maracura camp. 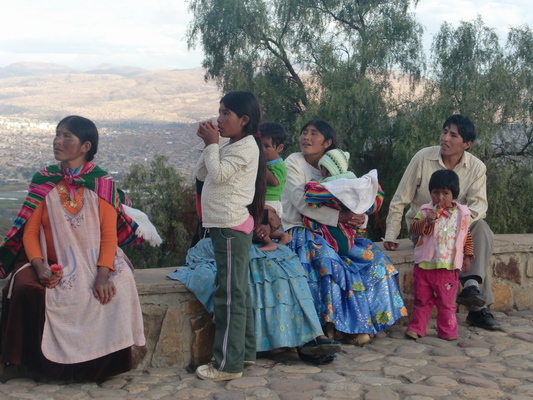 First we headed back the highway to Cochabamba 25 km to the next village Yapacani. Fortunately the maximum speed of our car was just 50 km/h because the steering wheel had a tremendous bearing gap. Limbert was constantly moving the wheel left and right. 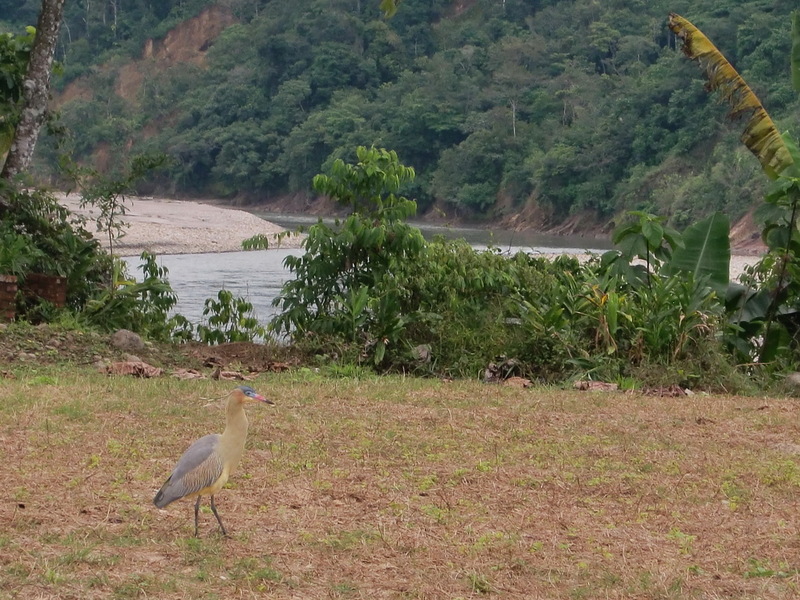 But the car was great on the extremely rough side road to the Maracaru camp. We had to pass several big rivers with fords. One was more than 50 meter wide and half a meter deep. After lunch we walked to a beautiful swimming pool through the jungle. 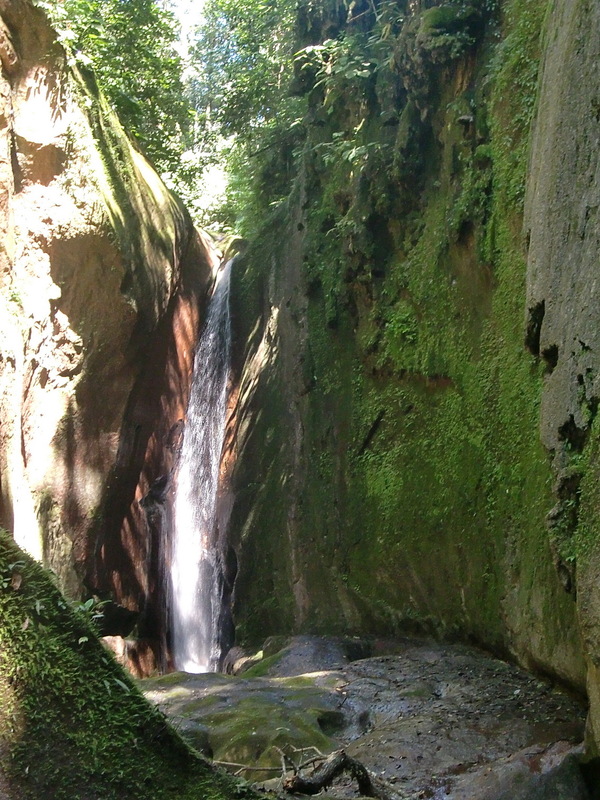 The next day we hiked to a marvelous waterfall through a rocky gorge. 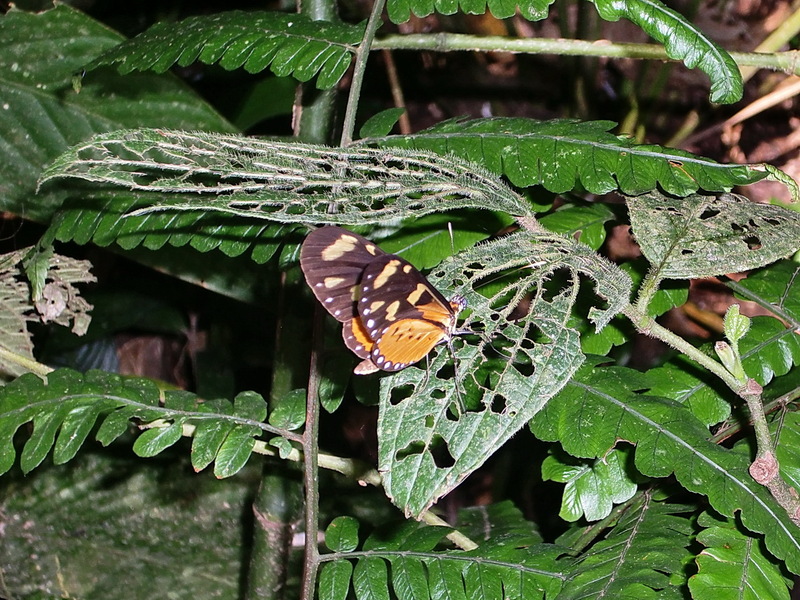 On the way to the gorge we saw thousands of butterflies with all colors. But it was very difficult to picture them because they were very flighty. They sat down only few milliseconds with closed wings. 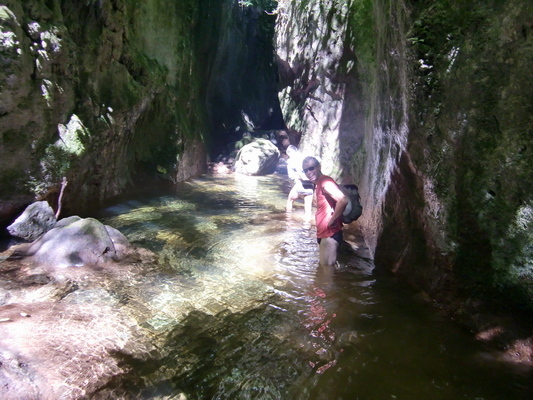 We had to go into the deep and cold water to arrive at the waterfall. Finally after several hours fight through the jungle we came to the waterfall in an outstanding and pristine environment. There was a nice swimming pool which we enjoyed despite the cold water (approximately 17°C). 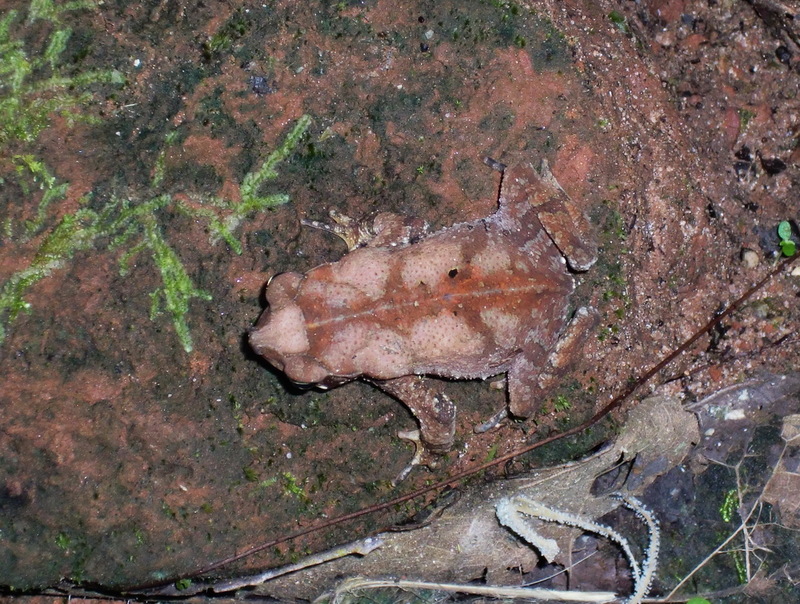 We saw some animals besides the butterflies and ants: Monkeys, birds, frogs and bugs and one tapir. The next day we walked with our backpacks to a viewpoint and to a camp in the middle of the jungle where we stayed the night. 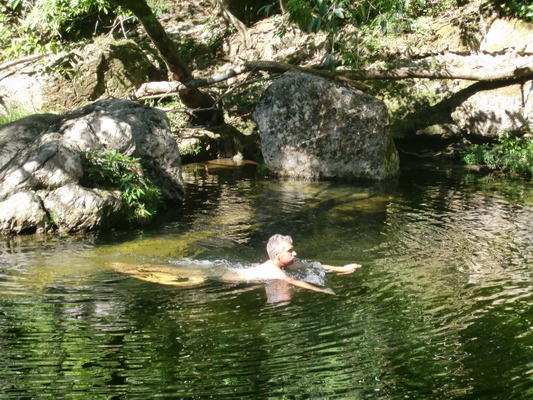 There was a nice pool with a waterfall close to this camp, which we enjoyed deeply. 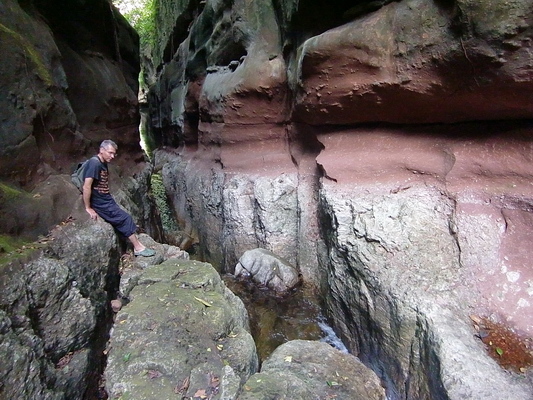 On the other side was a narrow gorge like a slot of a letter box. 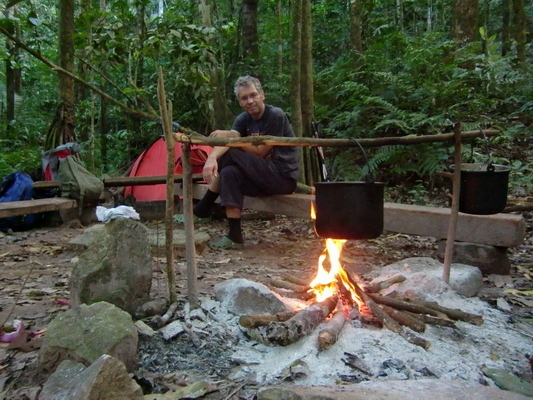 Limbert cooked a delicious dinner, but we had some trouble with mosquitoes despite the fire. It was itching like hell. And we found several ticks in the following days on our body. 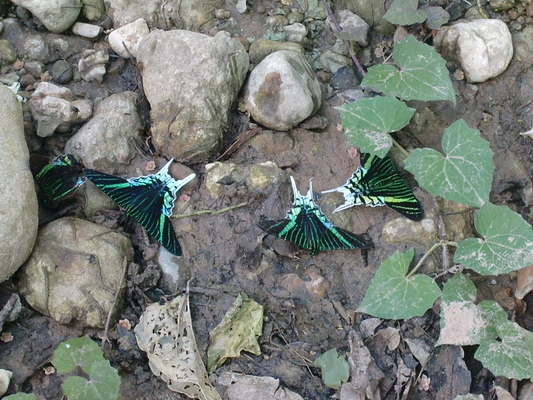 There were again a lot of butterflies with all colors when we returned to the car the next day. 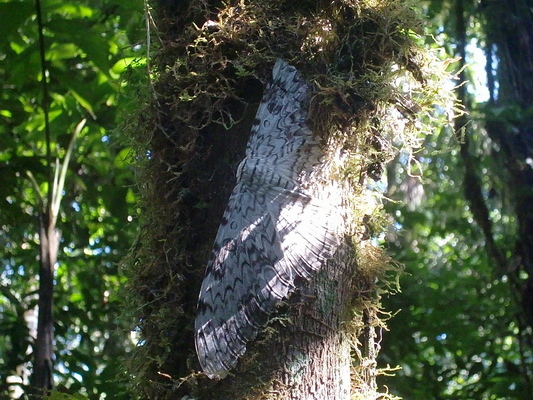 The highlight was a black and white moths sleeping on a tree. 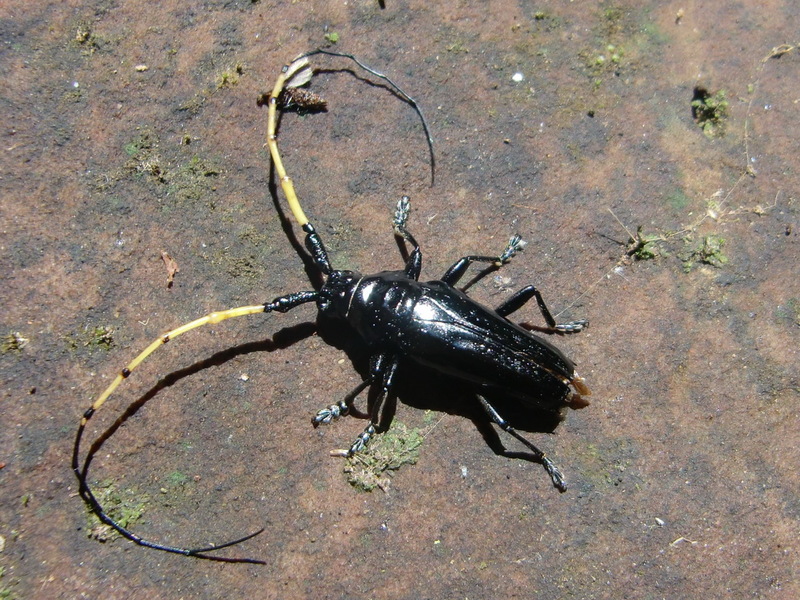 Its wingspan was approximately 25 cm! 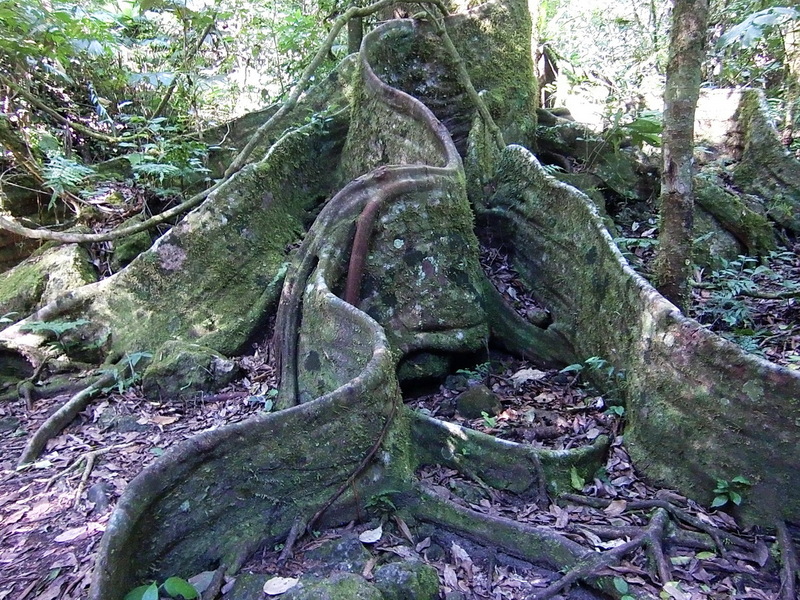 When we hiked in the Peruvian jungle near the Amazon we saw walking trees -- like the "snake root" ones you saw. They move a few inches each year - looking for sun through the canopy of trees. Love seeing your photos and reading of of your adventures.